Legos are the multi-colored building blocks of every child’s imagination. From train sets to movie sets, building intricate sets and fantasy characters is easy as pickup, place, and snap. That said, it can be daunting for a child to build something from nothing. 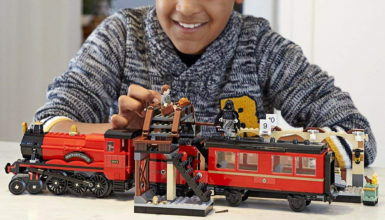 However, Legos provides a variety of themed sets that allow children to build their favorite fantasy characters or machines from their favorite movies. Perhaps the best thing children can build–something that suites the idea of building-block construction–are robots. Enabled with wings, wheels, and gears, Lego’s robot sets offer a new level of interactivity. The Future Flyers is a transformer-style robot that allows children to build the signature white robot with orange wings. However, with a few adjustments, the pieces can be fit to form a science-fiction sports car or a futuristic jet with reverse, forward-facing wings. Other features include a rotatable robot head, and the clear-plastic windshield doubles as the robot’s eye. Note: as this kit contains a metal ball, it is listed as a choking hazard. It is not for children younger than three years of age. The Power Mech robot kit contains everything a child needs to build a burly, green robot. However, the three-in-one design also allows the robot to be transformed into a helicopter or a truck. The robot features gripping “hand-grabbers,” green armor, and twin antennae. In terms of flexibility, the robot’s arms and legs can be rotated, and the truck’s tailgate opens. Of course, the helicopter’s rotor spins. The robot’s head does not move. As would be expected of the defender of the universe, Voltron is a towering, multi-colored extravaganza. Each arm or leg is a different color, and his chest is emblazoned with a gray-iron crest. His wings extend upward at 45-degree angles over his head, and he is protected by thick Lego-brick armor. One of the best features is that his build allows for up to five different poses. With multi-builds, children can engage in private-play story-telling as Voltron adopts different poses for different battle scenarios. Unlike many other robot sets, the Voltron set is for fairly advanced Lego builders. 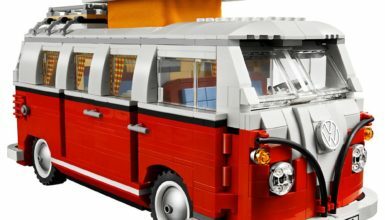 For instance, the set contains 2,312 pieces. Yes, you read that right–this set has over two-thousand pieces. So many pieces allow for the creation of additional figures, such as up to five different power lions. At over 15 inches in height, Voltron is the largest Lego figure ever made available. Unlike most Lego’s robots, which are the character, this set allows children to build combat machines for Surge and Rocka. Surge and Rocka are two, plastic figurines, one yellow, one blue, and they fit into the canopy of the Hero Factory Combat machine. The war machine includes seats for both the pilot and the co-pilot along with clear, detachable cockpit shields. Weapons include missiles and a fire shooter. Joints allow for a minimal amount of rotation, clear, plastic pieces serve as shields, and armor overlays. The combat machine can be constructed into one large unit, or it can be divided into two combat vehicles. The first vehicle is the mini-edge glider with a pilot’s seat and gray wings. The second is the two-legged war robot, also with a pilot’s seat. 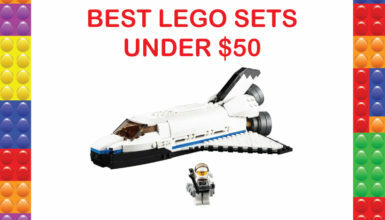 This set completes into a toy that is over nine inches in height, so it offers a lot of building for the buck. 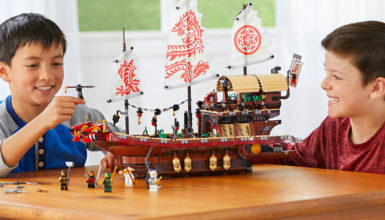 With 188 pieces, the set is best for children ages 8 to 14 years of age. Note: the weapons that snap into the hands of either Surge or Rocka are small pieces that might present a choking hazard for younger children in the house. Few Lego toys are as intricate as the Ninjago 70592 Salvage robot. The kit includes four Lego figurines, one mini robot, and the large salvage robot. The salvage robot comes with a spring-loaded bow and a spinning wheel with an attached grabber net. The set features a lot of decals and muted colors. The open hatch will hold one of the figurines, and the head unit also serves as a detachable skate board for eject-style escapes. The bow is functional and will shoot little plastic projectiles. Additional hidden storage compartments provide a fun way to hide extra weapons, loot, or treasure. Perhaps one of the best features that you might not expect is the final robot is well-engineered with a low center of gravity. As such, it will stand un-aided. Additionally, multiple poses are possible, enabling a variety of playtime adventure scenarios. Unlike Legos of yesteryear where little blocks formed little square forts and houses, the Lego Mindstorms comes with a remote control. Of course, you think, the robot is not an actual robot. It does not actually work. It is just a bunch of Legos pieced together in the shape of a robot. In that assumption, you would be wrong–very wrong. In terms of Legos, the Mindstorms is a engineering feat, enabling kids to build fantastic robots. For instance, the remote has forward and backward buttons to guide motion, and these robots are just that–robots. They are fully functioning robots that just happen to made of Legos. The EV3 Storm is the primary robot. It is bipedal, and it’s arms and legs move. It stands at just over 14 inches in height, making it a fun, significant toy. Its right hand is a triple-edge blade that spins. Its left hand is a bazooka blaster. The Track3R is a wheel-based unit with an extended camera-like “tracker” section affixed to the vehicle’s front. It has wheels wrapped in tank track, and it is powered by a rear exhaust. The GRIPP3R model receives its name from this build’s gripper functions. Fully functioning grippers can hold tight and lift any small object. The overall look is similar to the EV3 Storm except the computer monitor is missing from the chest. This snake-inspired build offers multiple moving joints, two gray eyes with red pupils, and tiny fangs. Inspired by a scorpion, Spik3R has articulating legs and a two-prong stinging tail. Heavy armor protects its back. In the center of the back is a LED screen. Finally, two fore-arms serve as pincers. The EV3 model achieves its versatility and power via the five build options and an accompanying app. Via the EV3 programming app, kids can program a variety of functions into the app. Standard functions include walking, talking, and rolling forward. 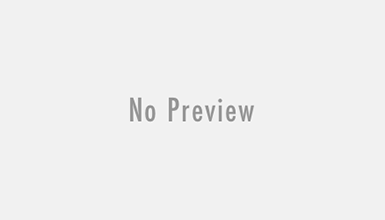 However, the EV3 programming language is a versatile programming app that encourages children to program other features like lifting arms and climbing. The speech component features a variety of text-to-speech options that enable a variety of phrases. It is important to note that the EV3 robot model features five primary build options, which are the ones listed above. However, it has instructions on how to build 17 different models. Furthermore, each additional model comes with its own unique functions and capabilities. These additional models are important and represent just how thought out this toy is. For instance, each new build option piques a child’s interest. However, because later build options still use previous programming techniques for various behaviors, the toy helps the child to “over-learn” the technology. Over-learning is a common technique for subject-matter mastery, and it is what makes this toy one of the best STEM toys on the market. The Lego Boost is another STEM toy that encourages childhood interest in science, technology, engineering, and math (STEM). Unlike the EV3 model, the Lego Boost is a fun-looking WALL-E-type robot with big child-like eyes, rover tracks, and two gripper hands. It is styled in light blue, black, and white. First and foremost, it is a complete Lego set. It comes with 847 pieces used to create the robot Vernie. Vernie stands over 10 inches in height. Other build options include Frankie the Cat, Guitar 4000, M.I.R 4, and Auto Builder. Each build option includes a variety of unique programming possibilities. For instance, Frankie the Cat can be programmed to walk and M.I.R. 4 can be programmed to roll, but it also has a functional shooter. Additionally, it can be equipped with a variety of accessories and programmed to battle other bots. The Guitar 4000, of course, can be programmed to emit a variety of music and sound effects. Perhaps the most unique build option is the auto-builder. It is unique because once it is assembled, it can be programmed to build other Lego models. That is correct. Once equipped with the fun-looking, lovable robot named Vernie, your child will be helping build robots that build other robots. Although this toy is certainly one further step toward the destruction of all humanity, it has won numerous awards and helps spark interest in STEM subject matter. A smart phone or tablet is required for programming. The auto-build feature makes this creative toolbox the absolute best Lego STEM toy available. – Except for the whole “end-of-humanity” thing, this toy might be the most perfect toy–ever.